LONDON, ENGLAND - FEBRUARY 02: An aircraft flies through London skies leaving a vapour trail on February 2, 2007 in London, England. Given the rage that air travel can provoke in even the most tranquil among us these days, it may be surprising that riot police aren't a more regular feature at airports. But Sunday's pitched battle between roughly 500 environmental activists and a phalanx of baton-wielding police at London's Heathrow airport wasn't about long lines, delays, lost luggage or missed connections. Instead, the protesters  who had demonstrated outside Heathrow all of last week  were trying to draw travelers' attention to the impact on climate change of the carbon gases emitted by the aircraft in which they fly. A placard from one activist at Heathrow expressed it thus: "You Fly, They Die." 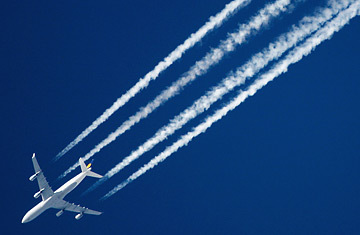 Airplanes operate on petroleum fuel, which means they release large amounts of carbon dioxide when they fly. Commercial air travel is currently responsible for a relatively tiny part of the global carbon footprint just 3.5% of total greenhouse gas emissions, according to the Intergovernmental Panel on Climate Change. But the unique chemistry of high-altitude jet emissions may produce an additional warming effect, while the explosive growth in air travel makes it one of the fastest-growing sources of carbon gases in the atmosphere. And unlike energy or automobiles, where carbon-free or lower-carbon alternatives already exist, even if they have yet to be widely adopted, there is no low-carbon way to fly, and there likely won't be for decades. And grow. The Airports Council International estimates that the number of airline tickets sold per year will double to more than 9 billion by 2025. Much of the growth will come in rapidly developing Asia, where passenger numbers are increasing by 10% to 15% annually. The already badly overburdened Heathrow  the busiest airport in Europe  is pushing to open up a third runway by 2020, a move that touched off last week's protests. Airplane manufacturers and airlines are working on ways to cut carbon emissions by raising fuel efficiency  building lighter and more aerodynamic planes, towing jets on the ground, and improving engine capacity. Designers are looking at running planes on biofuel, and Virgin Atlantic head Richard Branson has promised to build a biofueled jet by next year. But industry experts believe such incremental changes could improve efficiency by 1% or 2% a year at most, while passenger miles are set to grow at 5% to 6% annually. "We're left with a sustainability gap," says Roger Gardner, chief executive of OMEGA, a British study group looking at aviation and the environment. So what's the solution? Perhaps that there is no solution, or at least no simple one  aside from just flying less, as the Heathrow activists demanded. And there's little sign of that happening, as air passenger numbers rose 6.3% globally through the first half of 2007. So, expect similar protests in the future. The activists at Heathrow threw out a moral challenge to those well-off on a global scale (anyone who can afford a JetBlue ticket) to stop flying in order to save the poor from the effects of climate change. It's not quite that simple, but until technology and policy catch up  which still seems a long way off  carbon emissions will only slow if consumers choose to use less energy, live more modestly, and fly less. In other words, stay at home to save the world.